Ideal for food preparation, food processing plants, agricultural facilities and more, WBW-M series scales feature an IP66-rated wash down housing and a large stainless steel weighing pan. Color indicators for under, okay and over limits make check weighing fast and easy. 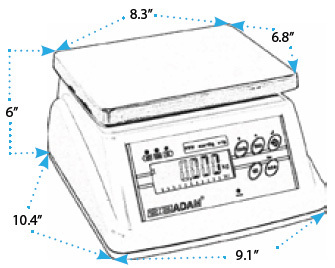 With nearly 40 years of experience in the production of scales and balances, Adam Equipment provides excellent value in products and service to achieve the best possible customer satisfaction. 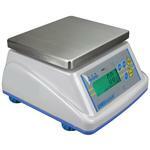 Check weighing product is faster than and other wash down applications. ever with the WBW-M’s color-coded LED indicators. Amber, green and red LEDs quickly show you if a sample is within over, or under acceptable limits without looking at the actual weight. An easy-to-read backlit LCD with capacity tracker shows capacity usage as well as the weight. The capacity tracker helps prevent users from exceeding the scale’s capacity when adding ingredients or making up batches. WBW-M scales can be moved to where they are needed, thanks to the internal rechargeable battery pack. And the vertical front panel makes them easy to read and operate on a counter, table or bench. IP66 rated for wash down environments with extensive sealing both inside and out give the ultimate in protection for those wet applications. Advanced overload protection helps protect the scale from overloads.